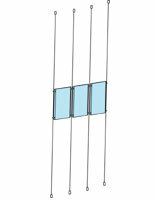 What makes this hanging cable system unique? 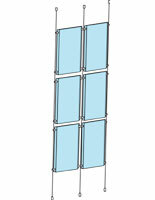 This kit has custom designed hardware that securely holds the acrylic panels in place. 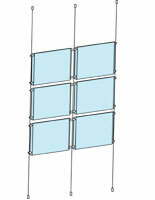 This hanging cable system mounts from the ceiling to the floor which is ideal for window displays. 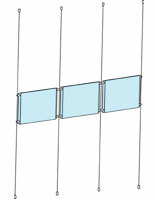 This suspended signage allows users to place signs back-to-back in the acrylic panels to create a double sided display. 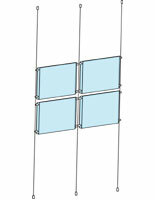 This hanging cable system holds 11"w x 17"h or 17"w x 11"h acrylic panels so signs can be printed from a computer and placed in the holders quickly and conveniently. Visual merchandising plays a big role in increasing sales, and this kit is the ideal solution to marketing signage in businesses. 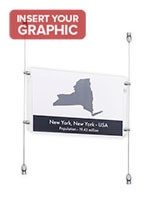 This hanging cable system provides high visibility signage and can be combined with other cable kits for a unique matrix! 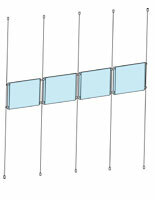 How can businesses effectively utilize this hanging cable system for visual merchandising? 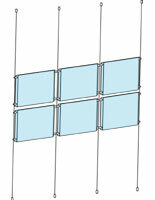 This kit comes with all of the needed supplies to install a marketing display in any store. 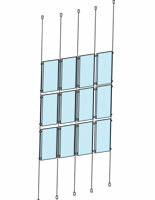 This hanging cable system is ideal for storefront windows to enhance products and essentially draw in customers passing by. 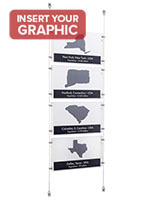 This display is easy to use and graphics can be updated as often as needed with the top-insert acrylic panels. 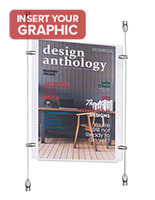 Visual merchandising is known to increase sales and traffic in businesses and this contemporary hanging cable display is eye catching and can be installed in the most visible places within an establishment. This visual merchandising tool, hanging cable system is perfect for retailers who want to increase sales with an attention grabbing display! 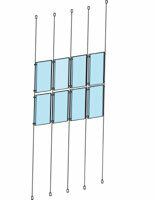 This kit is the perfect addition to any window display. 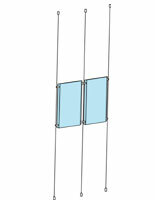 This hanging cable system, also known as a suspended window display, is perfect for displaying promotions and sales in businesses. 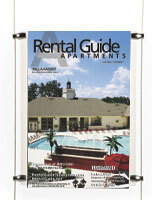 The acrylic panels included in these systems hold 11"w x 17"h or 17"w x 11"h signs. 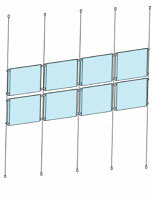 This hanging cable system takes the guesswork out of creating high visibility visual merchandising displays. 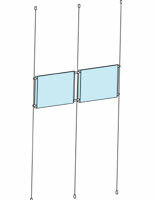 The ceiling to floor mounting kit includes rolls of 16ft length wire to fit even the tallest ceilings! 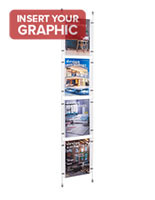 This hanging cable system is versatile and could be used to display promotions at retailers, new menu items at restaurants, pictures at art galleries and much more! What items are included with this kit? 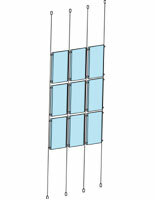 This hanging cable system is equipped with custom designed satin silver anodized aluminum panel mounts for a modern appearance. 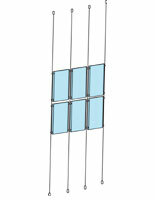 The stainless steel braided wire is also included and has a nylon jacket so the wire does not fray. 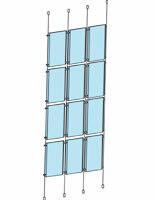 This hanging cable system comes with crystal clear fold-over acrylic panels with a top insert design. 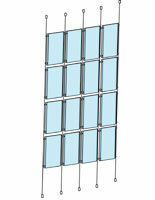 The fixed ceiling and floor mounts are also included and can be mounted where desired by the user. 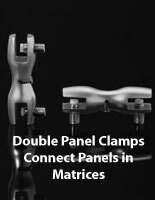 There are many different matrix configurations sold in this online catalog to provide a solution for everyone. 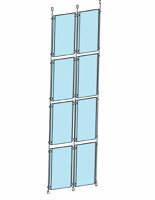 Users can combine kits with different sized acrylic panels to create unique systems that will draw the attention of customers. 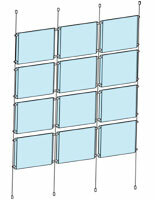 When placed in a storefront window, customers passing by can see the display but if users place graphics back to back in the acrylic panels, customers inside of the store can see this signage as well. 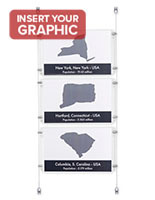 This kit has all of the needed hardware to install from floor to ceiling so users can decide exactly where this display will fit best in an establishment to generate the most attention from customers. Visual merchandising is a vital tool for many businesses. This advertising tool can be utilized to portray products in their best light and generate excitement about new products by highlighting them with this appealing suspended display! 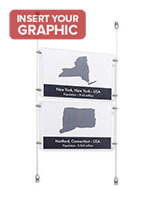 It has been said that visual merchandising tools can increase sales and traffic within an establishment and this sign hanging kit makes it simple to create signage that will demand attention. These kits are in stock and ready to be shipped! 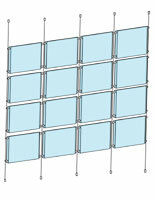 These acrylic panel systems are a high impact display that are highly visible to customers. 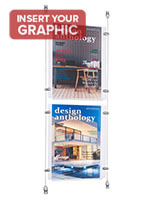 This contemporary display is eye catching and perfect for storefront windows.This display is ideal for storefront windows and includes crystal clear acrylic panels, which provides advertisers with the option of displaying multiple advertisements or several prints that form a cohesive image. 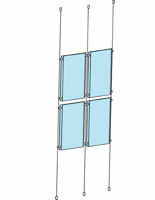 This kit mounts from ceiling to floor and holds acrylic panels. Generate revenue with this convenient and ready-to-install kit! 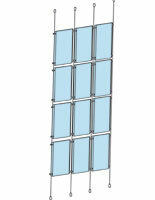 This system is ideal for window displays and can hold marketing signs! The acrylic panels allow for quick and easy switching of graphics so users can change signs when needed to make constantly changing signage. 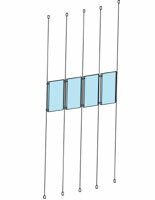 This kit is sold as part of the sign system category. 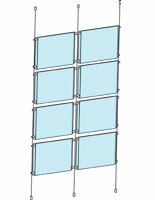 This category has a large selection of wire suspended sign options. For more signage needs check out the sign hardware category! 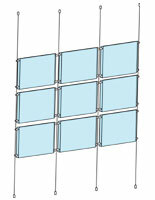 These products are all at affordable prices and are designed to be compatible in order to create unique displays! 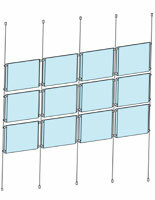 In addition to supplies for suspended signs, this site has thousands of in stock POP displays to choose from. 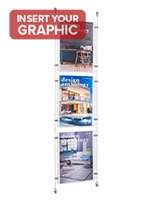 Browse this online catalog to find all advertising display needs!